It is that time of year again. 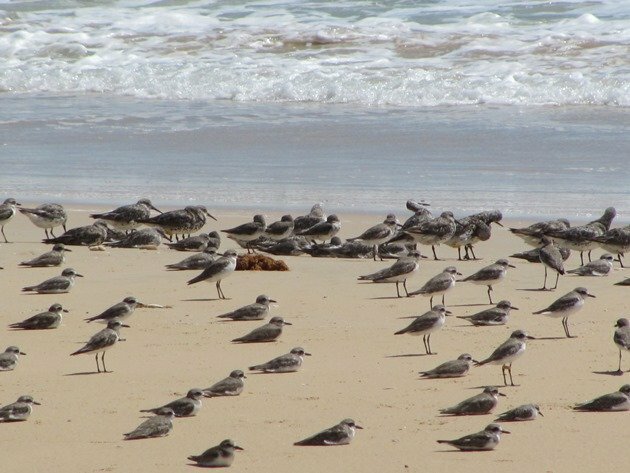 We are observing a large increase in the number of shorebirds arriving back in Broome after their travels to the northern hemisphere to breed and many are returning with good breeding plumage. 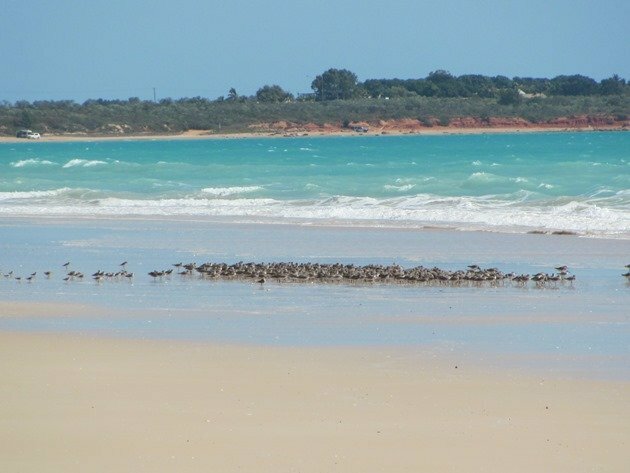 They are roosting around Roebuck Bay and Cable Beach at high tide during both the day and night. 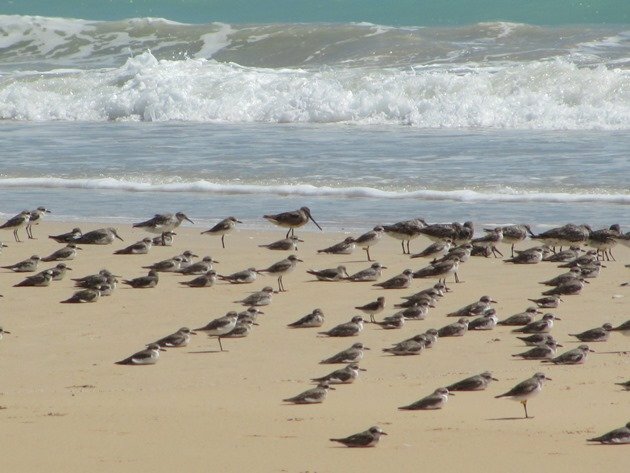 During the day Cable Beach is used by the smaller species, but at night the larger species also join them. 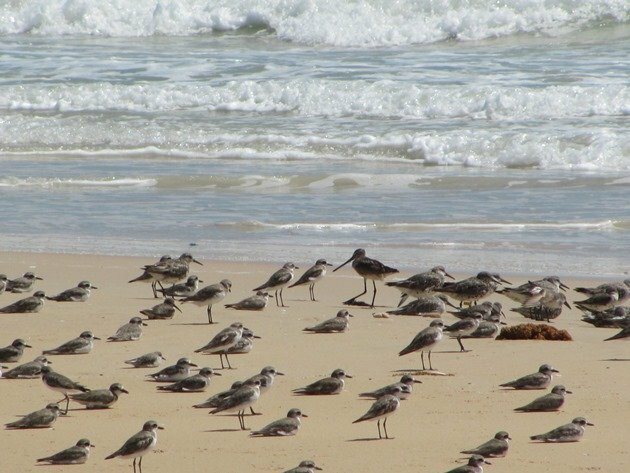 Thousands of shorebirds will now call Broome home until March, April and May next year when they will once again head north to their breeding grounds. 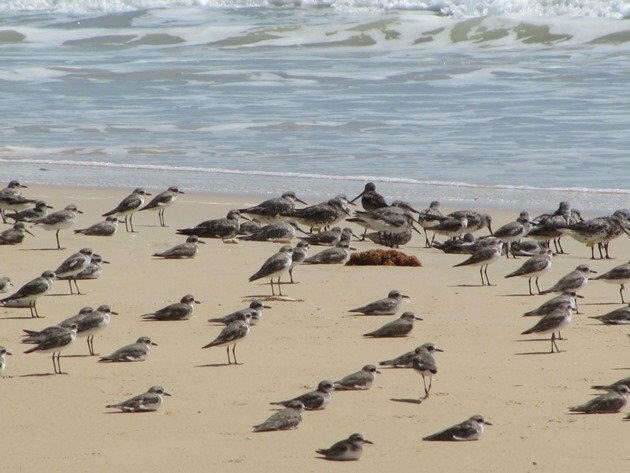 In Roebuck Bay the Great Knot and Red Knot roost at high tide for a considerable amount of time and wait for the mud flats to be exposed, but on Cable Beach there is no mud and they feed almost immediately after the tide drops on small bivalves. 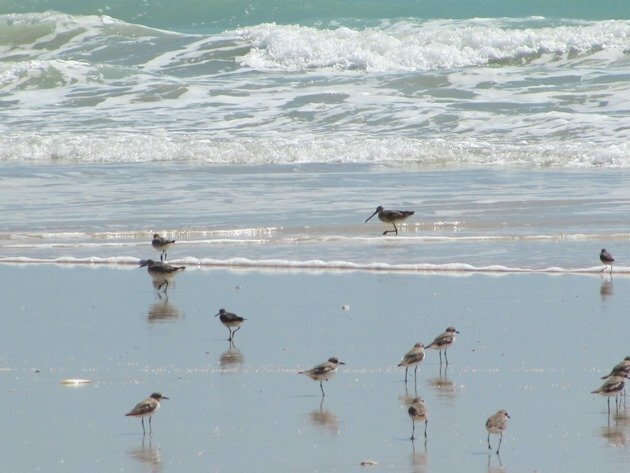 During the past week we have been onto Cable Beach to observe the shorebirds at high tide and to look for any individually marked birds from either here or overseas. 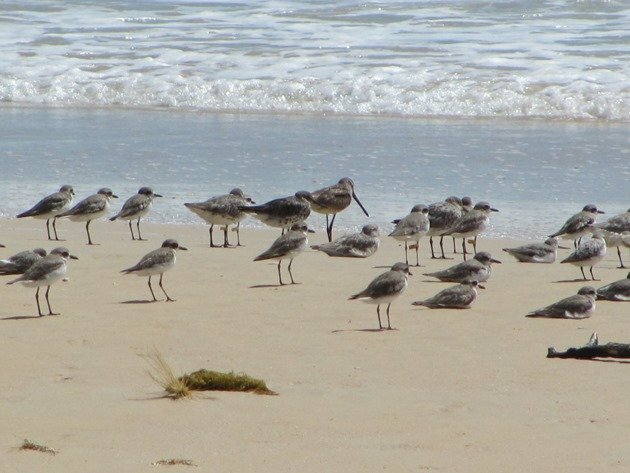 On Monday the flock was predominately Great Knot, Red Knot, Curlew Sandpiper, Greater Sand Plover, Lesser Sand Plover, Red-necked Stint, Sanderling, Terek Sandpiper and Grey-tailed Tattler. We were looking through the telescope and recording individually marked birds and then stopped briefly for a drink. We looked at the flock and suddenly a bird stood up. This bird was unlike any of the other birds in the flock. This was a tall bird with long legs and a very long bill. Even without binoculars it stood out! 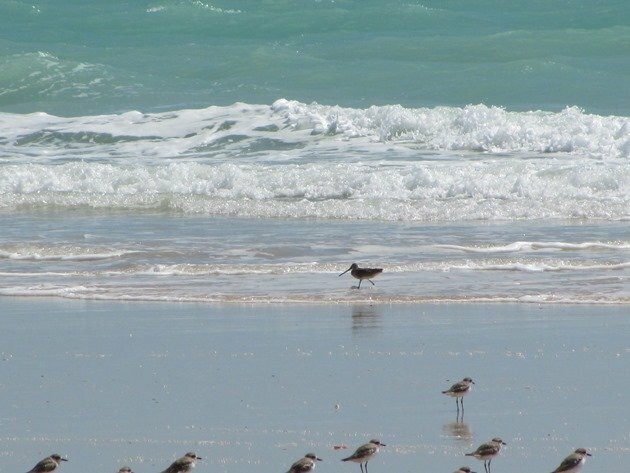 We have seen Asian Dowitcher in Roebuck Bay, but never on Cable Beach and this was a fine specimen! It walked out……..what a bill! It still had some breeding plumage and relaxed for some time until the tide dropped. It joined the Great Knot at being first to head into the sea to feed. 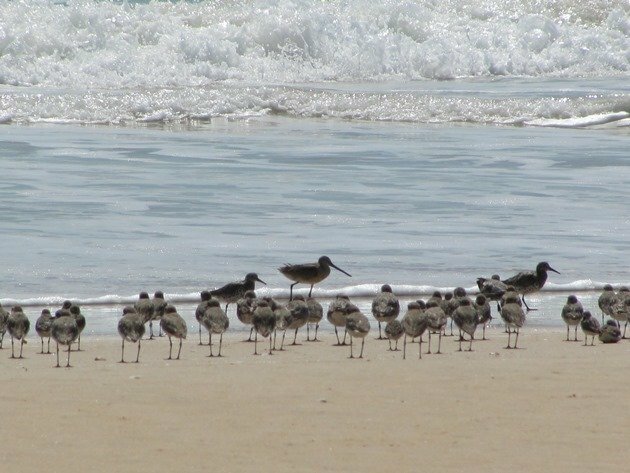 Asian Dowitcher with other shorebirds. This fine bird was our 365th bird of the year! We recorded a lot of individually marked birds once we had finished enjoying the Asian Dowitcher and several had been seen overseas this year. 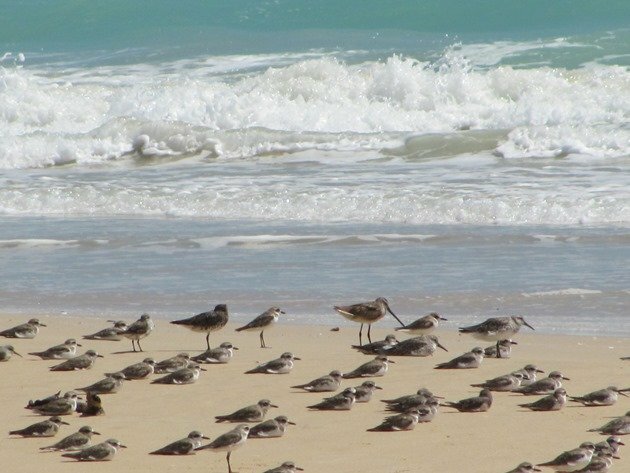 One of the Great Knot was last seen in Bohai Bay in China heading north on 17th April to its breeding grounds and it has made it back safely. Two of the Greater Sand Plovers were seen in Mai Po Nature Reserve, Hong Kong on 1st and 27th April on their way north to breed and have also made it back to Broome safely. 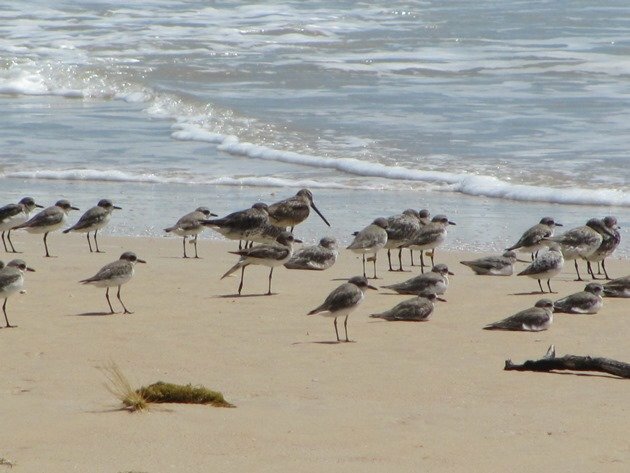 All of the other individually marked shorebirds we recorded were last seen in Broome prior to migration and this was their first record on their return. Although they were not seen overseas it is still incredible to think that they have travelled such distances and made it back to Broome safely. What a beautiful looking beach! I am starting an initiative to have such posts banned from the internet. As you saw in my last post, I am not young enough anymore for my heart to cope with these things. An Asian Dowitcher alone has heart-attack potential, but as a matter of fact, any of those “other shorebirds” would force me to my knees if I saw them here in Germany. What is the State Bird of North Carolina?